Greetings from a very cold, icy & snowy East Coast! It's because of this weather that I decided to do a tropical themed page. In addition to the fact that I haven't yet scrapped about my three year wedding anniversary trip which happened in early October 2010. I have the tradition of at least doing one page of where we go or do for our wedding anniversary. Well here's the one for year three. I primarily used the papers that came with the Swirlydoos January kit. The bright colors of this kit was just right for this tropical, warm page. 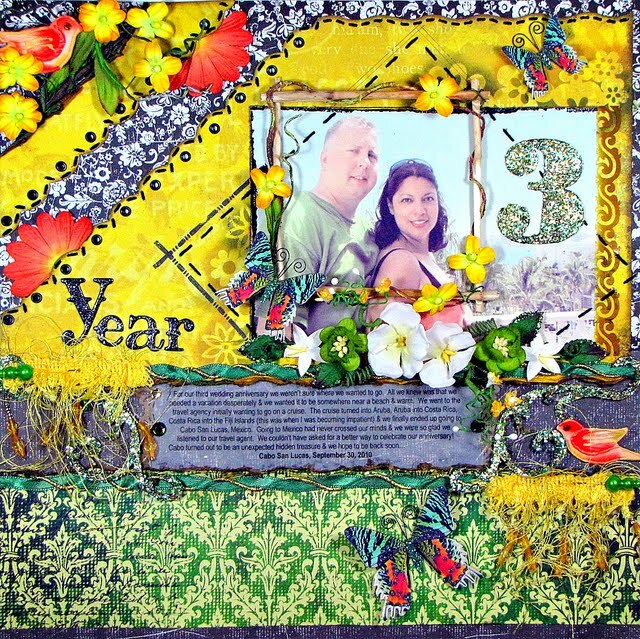 The flourish chipboard is covered in leaft glitter. For a tutorial on how to embellish your chippies with leaf glitter & UTEE, feel free to go here. The majority of the edges are distressed & inked. I completely ripped apart a prima songbird vine that came with this kit. You'll find pieces of it all over my page. Here's one of the birds from the vine. Oh & here's the second bird tucked in the corner along with more flowers. I used my Sew Easy tool by We R Memory Keepers to pierce scalloped shaped stitching holes. This tool allowed me to stitch scallops without too much of a hassle! I then inserted eyelets along the scallops. The tropical vine pictured here is an item found in my Etsy shop. If you like it--feel free to check it out. Ooops, there goes more of that prima vine. I wrapped some flowers & parts of the vine all around the bamboo frame. A closeup of the leaf glittered 3. For a tutorial on this, please find it here. You can also see part of my stitched frame here & my flower masking. Finally, one of the latest additions to my growing butterflies in my Etsy shop...Madagascar Sunset. This little beauty was based on an existing butterfly from Madagascar. However it actually isn't a butterfly--it's a moth. But for the simplicity of my shop--it fell under the butterfly category. Just some butterfly/moth tid bit for your knowledge. Either way, this little guy was just right for my page. Hope you enjoyed my 'tropical' page--especially if you're in cold weather just like me! May it bring you many warm thoughts! OH. MY. GOODNESS!!! Wow! What an eye catcher!! I LOVE IT! Where do I start? love the stitching and eyelets, the placement of the flowers, that vine is going to be one of my new faves, the masking in the background is awesome and will have to try that... love the distressing, the chippie altering looks fab... and the moth disguised as a flutterby is perfect for this page! You rocked these papers girl! You were right about being them being the perfect papers. I'm still wondering what to do with them LOL. FANTASTIC layout filled with technique! What a gorgeous page! I love all of the different elements you used and some really cool techniques! I read the tutorial on the UTEE and glitter leaf and I LOVED IT! Thank you so much for sharing such a gorgeous page. Wow, me encanta!!! Los colores estan divinos!! si bien tropical!! Hermosa pagina, Kay!! me encanta el frame de bamboo! Awesome Layout! love the butterfly details.